The 10th anniversary of Hastings Fat Tuesday is promising to be the most lavish to date with plans to make the Umbrella Parade a truly spectacular event. Fat Tuesday is the day before Ash Wednesday and the start of Lent leading up to Easter ; and it is celebrated around the world in many different festivals and carnivals. 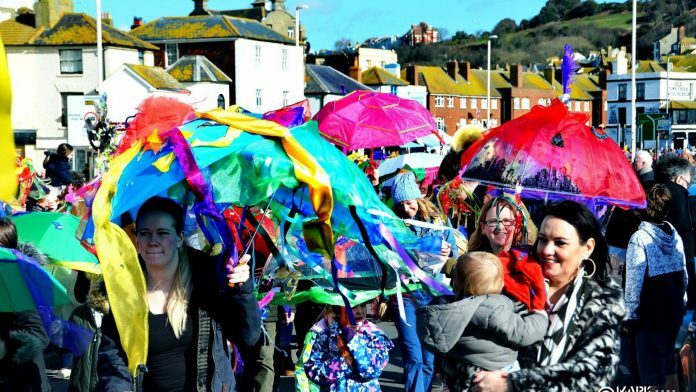 The Parade will start from the Stade at midday on Sunday March 3 and travel down the seafront, around the roundabout and back up to St Mary In The Castle. Radiator Arts are on board again this year organising two free workshops so come and pimp your umbrella ahead of the parade at one of their drop-in open workshops. The workshops are free and suitable for everyone; children must all be accompanied by an adult. You will need about an hour but you can spend longer if you wish. There will be a wonderful array of materials to use but a limited number of umbrellas so if you can bring your own that would be great. The workshops will be held on Saturday March 2, from 11am to 4pm at The Stade Hall, 20 Rock-A-Nore Rd, Hastings TN34 3DW, or Ore Community centre, 455 Old London Rd, Hastings TN35 5BH. The full Hastings Fat Tuesday 2019 programme will be announced soon. For all the latest news and updates visit the Hastings Fat Tuesday website. Image Credits: Hastings Fat Tuesday.